Director Liman states proudly (or arrogantly) in the specials that he took the book and threw it out because he was making a movie. He may have been hasty. He thinks he made a movie. I’m pretty sure he didn’t. At this point I should warn you they are planning to drop a trilogy of these on an unsuspecting public. It’s not so much bad as totally bloodless. At best I found the characters mildly irritating so when our hero teleports himself full speed into a tree I think I was supposed to be sympathetic, not amused. That’s what Jumpers do, they think themselves places like Bank vaults and the head of the Sphinx, which he does a lot and oddly enough when there is not a tourist to be seen on the Giza Plateau. Amazing timing. Not a bad premise for a film, but they didn’t execute, they murdered. I’m not going to blast the players here as this is the Directors baby since it would be difficult for everyone in a piece to be that bad without a firm hand at the helm. I would be remiss not to mention Samuel L. Jackson’s hair which looks like astro turf spray painted white. Distracting but at least it gives one something to look at. I suggest you pass one this one. If I had it to do over again I would. 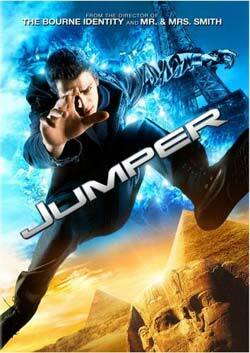 I haven't seen Jumper, nor do I plan on it. I'd already heard how they completely ripped the novel(one I quite liked, as well as Reflex). So they're planning two more. That's at least two more movies I won't waste a dollar on.